An editorial calendar is essential to brand marketing success. Here are 7 powerful tools to manage your editorial calendar effectively. An editorial calendar is essential for successful brand journalism. Surprisingly, this foundational element is missing from many brand marketing strategies. The desire to hit the ground running often overwhelms the practical utility of planning. But without a place to brainstorm, and then prioritize those ideas, many brand journalism efforts are doomed from the start. Make it easy to collect ideas for potential content topics. Track the sattus of a piece of content from conception to publication. Easily assign and track who is writing which piece of content. Act as an archive for all content generation activities. Offer deep customization to embed structured processes for each stage of the content lifecycle. Work just as well on mobile as on desktop. 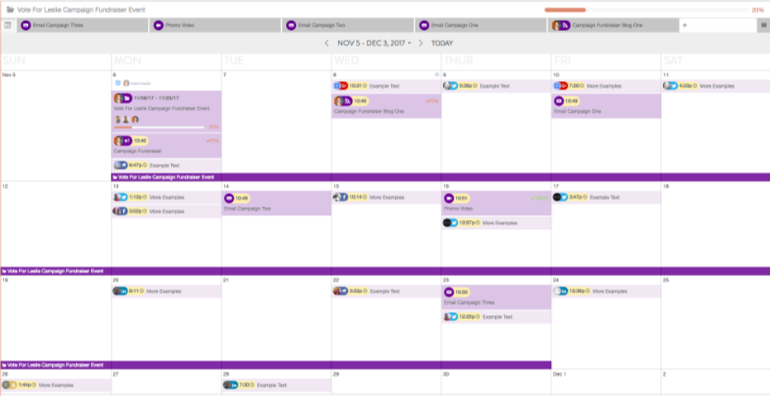 After years of testing different strategies, here are seven powerful tools to manage your editorial calendar effectively. Each option is a solid choice, and it really comes down to personal preferences. Our recommendation is to try each tool for a set period of time to see how it works for your organization. Test the desktop experience as well as the mobile experience. If you can't use it in a real world situation, try to replicate the conditions of use. This gives you the clearest idea of how much the tool addresses your needs. A small experiment is a worthwhile investment that gives you the confidence you need to make this important decision. You want to make the best decision you can up front, before pulling in the rest of the moving parts! This is our favorite tool for managing editorial calendars. Trello is versatile with plenty of add-ons to customize functionality as needed. It's simple to set-up, and relatively intuitive when bringing in new people. Nothing can beat the Post-It note simplicity of the interface. In the image below, you'll see how we track content from the idea stage to client review. In our case, we have a significant review process as content goes through client review. We also have multiple pieces of content in progress at any given time, generally based on our editorial sensibility matched with client priorities. By prioritizing certain pieces, We bubble up the most impactful story ideas into the content creation workflow. What we like: The cost is reasonable, and Trello's automations improve workflow. While there are additional costs involved with certain add-ons, these integrations provide customization for a variety of workflows -- Trello can be used for almost any type of project or tracker. For traditional project managers familiar with Gantt charts, Trello add-ons transform boards into charts. We also like the ability to change backgrounds and use an image to reflect the content of the board! CoSchedule is a full-featured marketing tool and content planner. As such, it's a little more complicated to get started. The service integrates with social media, which means that you can see a full marketing view alongside your upcoming content features. This integrated view can be highly useful for brand marketers. As you browse the calendar, you can create content types and even begin to write articles right there in the flow. This can be useful when wanting to provide an outline or light structure for a particular article and then assign to someone on your team. Admins can assign tasks, and even make it so approval is required for task completion. This granular approval process is appealing for larger organizations or situations with lots of contributors that need more monitoring. For those managing multiple calendars, for example, several client blogs or departments across the company, CoSchedule really shines. It has the potential to be the core of all marketing planning, content creation, and social media management. For those looking for something a bit more simple, CoSchedule might be too much. What we like: The direct integration with WordPress makes this a powerful tool to manage both the editorial calendar and social media distribution. While more complex visually than Trello, the beauty is that CoSchedule reminds you to also create a marketing plan for your content. And when it's integrated within your blog flow, it can ensure that everyone is using the same process through tasks and team communications. Think of AirTable as a massive evolution to the spreadsheet. It's endlessly customizable for all kinds of different uses. This is an advantage, as it makes for a versatile tool. Some might not like the spreadsheet-like approach, and others might find it more comfortable. 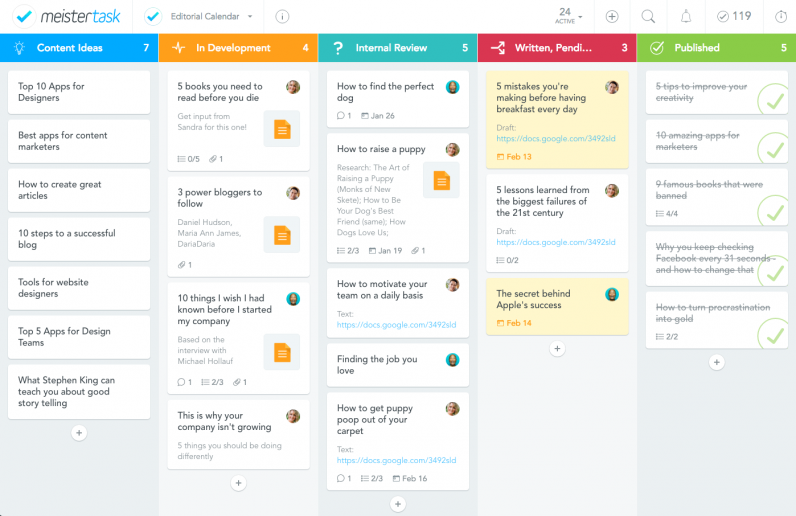 Airtable offers different views, such as kanban and calendar, which appeals to both the creative and the rational. One of the useful parts of Airtable is the way that they build out 'bases' of content. These are basically connected spreadsheets, where individual records are sorted and tracked. From these bases, you can then push out pieces of content across different workflows. This means that changing the status of one item can trigger a move to another view. For example, a piece of completed content could be pushed into the view for the social media manager. What we like: Airtable takes some getting used to. But it does offer the most customizability out of all the tools listed here, without the need to integrate add-ons to build out the features you need. This makes it good for complex workflows across multiple stakeholders. It's very versatile, and workflows can be customized for each client as needed. That's a huge advantage if you're looking to evolve productivity in your business operation. The free plan is also a smart move to get users hooked before having to shell out cash! Monday is kind of like a blend of Trello and Airtable. It offers more features out of the gate, without having to enable add-ons for more functionality. Content can be viewed by status, person, or date, as well as on a timeline overview. Communications occur in-line and attached to each piece of content. 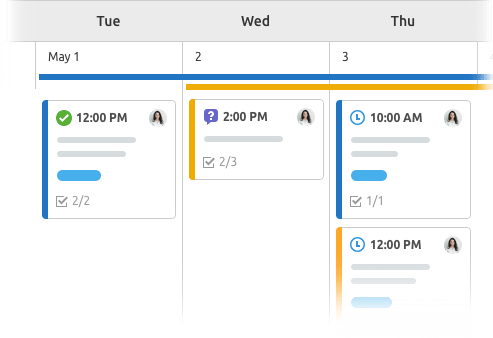 Like Airtable and Trello, Monday is also quite flexible, with use cases extending from editorial calendar management to planning social media. What we like: This is a full-featured project management tool that can be used for things beyond an editorial calendar. Given the potentialUtility across an organization, User adoption might be easier to achieve. The interface is clean and crisp. The overview functionality to see what your team is working on over the next weeks is quite useful -- especially for remote teams. The communications are also easier to navigate than Trello (where comments often seem buried and are hard to follow without threaded context). This is a relatively new product from SEMrush. It's meant to integrate into existing workflows of SEO-focused content marketers. It has all of the required features: A calendar view to track content progress, communications features for team collaborations, and the ability to track team progress on content items. What we like: It's free! That's always helpful. The integration with SEMrush Is also extremely useful for content creators focused on SEO. Having these tools baked in saves time. Of course, this gets expensive as you start adding additional services from the company. Clearly, this is a way to pull you into the ecosystem, and then upsell you on additional services. So while we like the price, the solution is limited as far as customizability. Asana and Trello are often compared directly, with those who love Trello pointing to its customizability and those who prefer Asana highlighting its focus on teams. 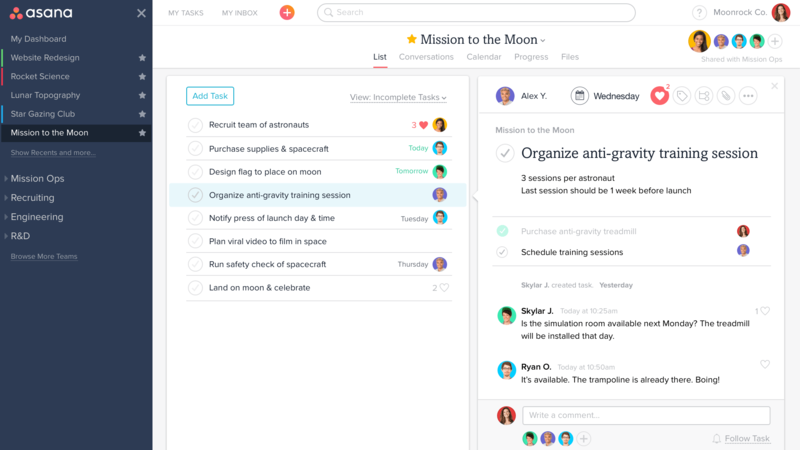 In our opinion, it seems like Asana is more comparable to Monday, and is also more involved in getting set up, as there's more to learn about its interface than Trello. The split view, which functions like panes in Slack, makes it quick to see specifics about a particular item. This interface is a bit different than the others and it takes some getting used to. But for those who like access to details, this is an informative interface. What we like: A focus on teamwork makes Asana stand out from other project management tools. The split view, similar to Slack, makes it easier to navigate because there's no waiting on cards to load when you click on them. 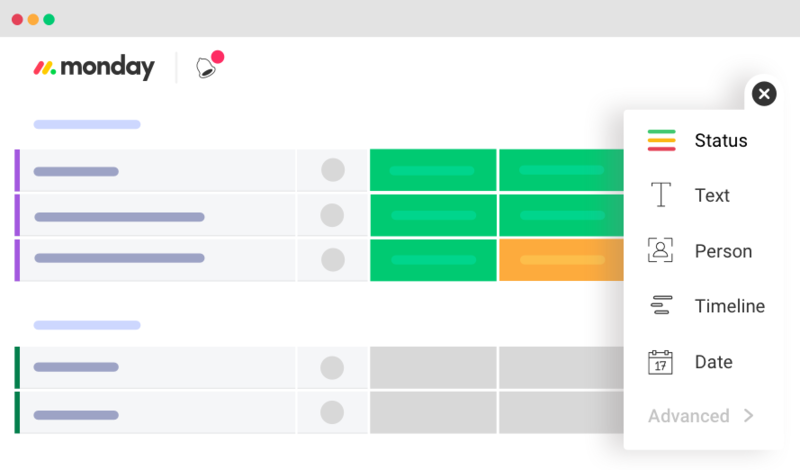 The ability to quickly switch between List, Calendar, and Timeline view gives you multiple different views into your team's current tasks and progress. MeisterTask is all about task management for teams. It has a very clean interface that reflects other card-based tools. There's not much else to say because it really is that simple! This is the tool for those who want to focus on managing task workflows without distractions. What we like: This is very specific, but we love how each header is customizable. This is impossible on tools like Trello. The visual distinction of each column is very helpful and pleasing to the us design nerds. The simplicity is also helpful For those who don't need a lot of bells and whistles. The focus is on task management for teams. Is your company blog unlocking its full potential? Our newsletter for communications professionals includes tips, tricks, and best practices from around the content and brand marketing worlds.